Zebrawood is truly an exotic wood, used in a limited way for veneer, wall paneling, custom furniture, furniture trim, inlay bandings, marquetry, specialty items and turnery. Because of its hardness, it can also be used for skis and tool handles but that might seem like quite a shame for such an dramatic, exotic wood species. More often today it is even seen in a collection of exotic wood floors. Zebrawood floors can certainly add a unique feel to any home decorating project. Just make sure that you don't find it overwhelming, as you'll have it for life. Exotic wood floors are expensive and your not likely to change it like the paint on a wall. It has a relatively small following of woodworkers that even knows it exists, but those that do and venture to use it, are awed by its dramatic colour banding. 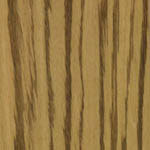 Zebrawood is distinctive for its zebra like light and dark stripes. The term, "zebrawood" is shared by several different woods with this particular appearance. The most common species available are from West Africa. They are an equatorial tree of medium to large size, gregarious, commonly growing in pure strands along riverbanks. Can grow to heights of 150 feet with trunk diameters of 4 to 5 feet. When cut it gives off an unpleasant aroma which disappears as it dries. We kid around in the shop, that when planing this wood it smells like our sewer has backed up. A heavy hard wood with a somewhat coarse texture, with the typical so-called zebra stripes, often with an interlocked or wavy grain. The heartwood is a pale golden yellow, distinct from the very pale colour of the sapwood and features narrow streaks of dark brown to black. Zebrawood can also be a pale brown with regular or irregular marks of dark brown in varying widths. It is almost always quartersawn to get the exciting alternating colour pattern and a straight grain. It is a true exotic wood, with limited availability and relatively high prices. Difficult to finish because of the dual nature of the grain but finishes well once it's filled. The wood itself has a lustrous appearance. This wood is easy to saw but difficult to work with. Of all the woods I have handled, this rates as the worst to plane. It does not seem to matter which direction it is feed into a planer, it tears out badly in either direction. Experts recommend the use of a belt sander as the only feasible way to get a good smooth finish. If you receive it presanded, it is relatively easy to cut to size for all your woodworking projects. Can be glued if done with care.